Not welcome at the mall. More than a dozen sources tell the New Yorker that Moore was either banned or "run off" from the Gadsden Mall in his hometown for persistently trying to pick up teen girls when he was in his 30s. Former mall employees say they were told to look out for an older man pestering young girls. "The general knowledge at the time when I moved here was that this guy is a lawyer cruising the mall for high-school dates," one law enforcement officer says. This is highly suspicious...as reported elsewhere, Moore was not the DA at that time, but rather only an assistant district attorney. Furthermore, it was the "Old" Hickory Inn not the "Olde". The signature has two different ink colors going from black to blue...very strange indeed. I put nothing past the establishment. Moore has all the right enemies. What's pathetic is that there are lots of brain damaged, right-winger "Christians" coming out from their swamps determined to donate to him. I mean, there are actually lots of these imbeciles living in this country. I hear music from Deliverance when I see these vermin on the news. 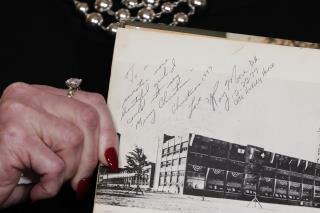 Just another curiosity, the date on the "autograph" is December 1977. In most normal school systems, they year book come out in May, close to graduation. Why the six month difference? Does this require an writing analysis by a handwriting expert?? ?